VALENTINES FOR LEVI . . . 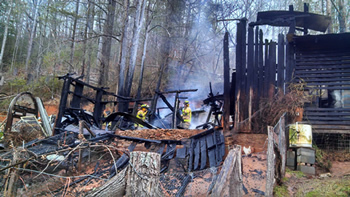 Phone call came in last night (Sunday, February 10, 2013) from emergency vet, Dr. Graves, who responded to a barn fire. STAR picked up this little horse, Levi, in the mud, rain and dark last night, walking him through debris, a fallen tree and barn wreckage. He couldn’t see due to his severely swollen eyes, but seemed to know help was at the end of that trailer ride and did everything that was asked of him.. He is only 10. Currently at University of Tennessee, where the prognosis is guardedly optimistic, he is receiving the best of care, which is costly. The UT is wonderful. Levi will stay in their clean environment for as long as he needs because we WILL raise the funds for his bill. All the techs are in love with him already! Can you send a ‘VALENTINE FOR LEVI‘? the owners would have put him down as they had no way to care for him. STAR couldn’t let that happen. Star Ranch gives a special Thank You to the ASPCA for their generous $500 gift to Levi’s medical bills. 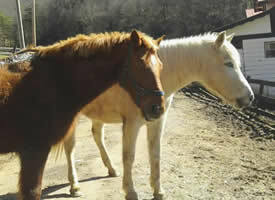 ASPCA has been a faithful supporter of STAR Ranch for the past several years. Had a good report from the University of Tennessee Tuesday morning. Levi’s burned eyes appear to be healing well and he is seeing out of the right. The cornea ulcers are superficial. There are a few burn spots on his back they are watching. Techs use sterile gloves, sponge bathe, and treat. Lots of antibiotics and TLC. Hydration is good as is his attitude. What a love. He IS the STAR valentine this year. More good news from the University of Tennessee this morning. Levi went for a walk in their covered arena. He took the opportunity to roll on his ‘itchy’ back! The techs then gave him another sponge bath and ointment. He is holding both eyes open on his own AND is seeing. 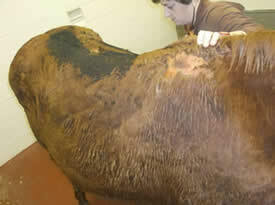 So far respiratory distress has not shown up but that takes a while as does the severity of the burns to manifest. He is making very good progress. Thanks for all your prayers and well wishes. More good news from the University of Tennessee this a.m. Levi went for a walk in their covered arena. He took the opportunity to roll on his ‘itchy’ back! The techs then gave him another sponge bath and ointment. He is holding both eyes open on his own AND is seeing. So far respiratory distress has not shown up but that takes a while as does the severity of the burns to manifest. He is making very good progress. Thanks for all your prayers and well wishes. And a special thanks to the ASPCA for their $500 grant to help Levi recover. Best valentine present ever! Levi is coming home to STAR Ranch on Friday afternoon. He did not lose his sight. He has a few 2nd degree burns to treat and continued eye ointment. Then all the hay he wants. WooHoo! Call if you would like to meet him in person. Levi’s story is on the local late night News, Channel 13. Levi has been living in a small barn and was stalled for 5 days at the University of Tennessee with lead walks for exercise. Boy, did he cut loose when he arrived home at STAR Ranch this afternoon. He is not supposed to get too much sun, so OF COURSE, it was cloudy and cool. Levi made the front page of our local paper (see The Mountaineer article) today. He has even attracted his own private nurse who works the burn unit. She comes every couple days and really dresses his wounds. And he has a holistic healing practitioner who gave him his first ‘treatment’ today. All good stuff! Now we just need to help Levi pay his medical bills. Please donate today! Levi making progress – and he can see! This story just keeps getting better. Levi has a girl friend! He shows most excellent taste in an ‘older woman’ Arabian mare named Sarai, who is 29 and always by his side, except at meals! All bets are off at mealtime. Also see Sarai on our Sponsorship page. 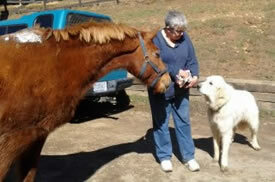 Volunteer Judy treating Levi and Hogan, who is the new Great Pyrenees at STAR Ranch. He has large ‘paws’ to fill. This is what Levi survived on Sunday night, February 10, 2013. What a brave little guy he is! he let all the techs work with him peacefully. Both eyes have ulcers and are swollen like baseballs. Levi is limping on the right – why wouldn’t he? It appears a burning timber fell on his back. Copyright © STAR Ranch Rescue. All Rights Reserved.